Federal Task Force Softens Opposition To Routine Prostate Cancer Screening : Shots - Health News The U.S. Preventive Services Task Force proposes each man decide with his doctor whether to undergo routine PSA testing, citing recent evidence of benefits and ways to minimize downsides of screening. A common blood test checks for elevated levels of prostate-specific antigens (PSA) in a man's blood, as an indicator that he may have prostate cancer. 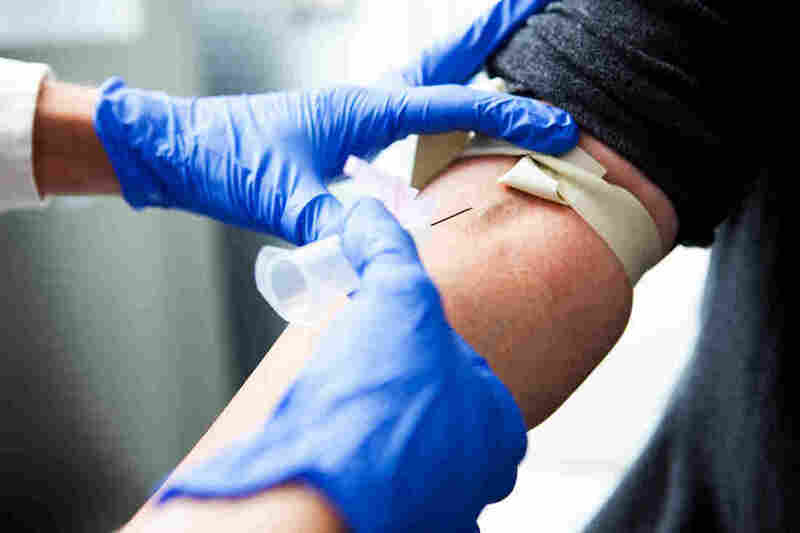 The proposal, which isn't yet final, pending input from the public, comes five years after the task force surprised many men and their doctors by recommending against the routine use of the commonly used blood test. That 2012 guidance prompted a significant drop in PSA testing. Almost 180,000 American men are diagnosed with prostate cancer each year and at least 26,000 die from the disease, making it one of the most common and deadly cancers among men. "The new evidence allowed us to say that, on balance, we think now the benefits do outweigh the harms," says Dr. Kirsten Bibbins-Domingo, a professor of medicine at the University of California, San Francisco, who chairs the task force. The latest research also suggests a small net benefit from screening, she says. "Therefore," Bibbins-Domingo says, "what we are recommending is that doctors and patients talk together about whether screening is right for them." "The PSA test is not a great test," Bibbins-Domingo says. "It doesn't help us distinguish the types of cancers that are going to kill you from those cancers that are going to not progress over time and will not cause a man health problems." At the same time, an increasing number of men confronted with a diagnosis of prostate cancer are skipping treatment, according to recent research. Instead, they and their doctors are opting for "watchful waiting" or active surveillance of the malignancy. That less aggressive approach to treatment minimizes the harms of screening, the task force says. So, in its proposed revision, the task force drops its "D" recommendation against PSA testing for men ages 55 to 69 and replaces it with a "C" recommendation that each man in that age group make the decision about whether to get screened individually — in consultation with his doctor. "There are some men who might say, 'You know, I really want to avoid dying of prostate cancer. That's the most important thing to me. So even if there's a small likelihood this will work I want to do it,'" Bibbins-Domingo says. Screening saves an estimated one or two lives out of every 1,000 men who get screened. And with treatment's risk of impotence or incontinence, it's also a reasonable choice for some men to decide, " 'I'm not willing to risk the things that may happen along the way,' " Bibbins-Domingo notes. "I'm very pleased. I view this as a victory for PSA screening for prostate cancer," says Dr. William Catalona, a professor of urology at the Northwestern University Feinberg School of Medicine. "PSA screening saves lives," he says. "And having the U.S. Preventive Services Task Force discourage PSA screening has sort of created a whole generation of family practitioners and internists who feel that PSA screening is a bad thing to do for patients. If this were to continue, we would lose all these gains in reducing the prostate cancer death rate." He says he wishes the group had gone further and recommended that doctors actively encourage PSA screening beginning at age 40 and continuing past age 70. Dr. David Penson, a urologist at Vanderbilt-Ingram Cancer Center, agrees with the task force's decision. "The idea of letting men make their own decision, I think, is a really terrific thing," he says, noting that the new draft guidelines are in line with those of other medical groups. But other doctors fear the task force's recommendation will be oversimplified into a recommendation for screening. Dr. Dan Merenstein, a family medicine physician at Georgetown University, doesn't think the new evidence warrants a change. And he worries the new guidelines are confusing. "What I'm afraid of is that rather than having this discussion — because it's a difficult and long discussion — physicians will just order this test like they do ... a cholesterol panel," Merenstein says. "And that will cause many more harms than good." "I really do think that there is a pendulum in a lot of things that we do in medicine," Brawley says. "And the pendulum here may be getting to the right place where we realize there are harms and there are benefits and individuals need to weigh these harms and benefits and tailor a decision that's right for them." You can weigh in, too. The task force is now taking public comment on the new recommendations.